Hailing from the Land of 10,000 Lakes, boats have always been a part of Sean's life. As a child, summers were spent on his family's sailboat navigating the many lakes and rivers of Minnesota. The teenage years brought a variety of jobs at a local marina. As an adult, Sean's first job was as a sales rep for his father's company where he learned some valuable lessons about sales, ethics and customer service. After a few years, Sean realized he could combine his love of boats with a sales career and went to work for a retailer of water ski and performance boats where he helped the dealer earn many Top 10 sales awards. 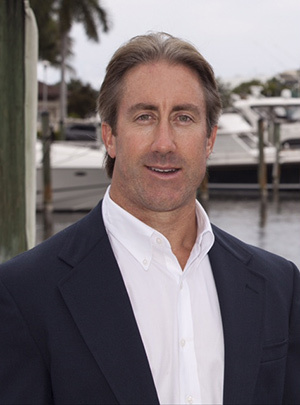 He spent the next decade with one of the largest marine retailers that ultimately extended his career into yacht brokerage. Sean has successfully enjoyed years of cultivating many close relationships with buyers, sellers, and brokers. "Over the last 20 years I have toured over 10 boat / yacht manufacturers in 3 different countries. The one thing that remains consistent is my passion for the yachting lifestyle and meeting the people that share this same love for being on the water."